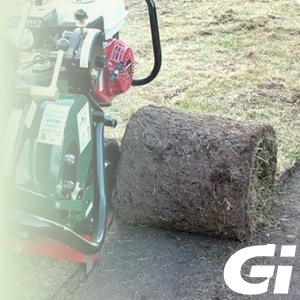 Groundsman Industries have been manufacturing Turf / Sod Cutters for over ten years with intensive research and development resulting in a range of products at the forefront in performance. Two and four wheel drive machines to suit application from general landscaping to sports turf or turf sod farms. The ability to cut sod a few millimeters thick accurately on flat or rolling teraine or the power to cut down to 75mm (3") thick in fine or rough. The versatility to perform other tasks such as Mole-draining and De-compaction to 13cm (5") depth. A Guillotine attachment to measure and chop the sod to length, a Reel Insertion Attachment (RIA) to insert pipe or cable down to 13cm (5") underground. The TC4GCO is a Guillotine Chop Off attachment which can be fitted to the TMC48 Turf Sod Cutter to measure and cut the sod in lengths for easy handling and for relaying purposes. The attachment is power driven by an auxillary sprocket on the TMC48 Turf Cutter to the chop activation clutch on the attachment. Chop Blades are available in 30, 35, 40, 45, 50 and 60cm widths. The chop length is adjustable to cut sod from 1metre to 5 metres long. Raising and lowering in and out of cut is gas-spring assisted via a caster wheel frame which stabilises and supports the machine in the raised position. The The Trench Insertion Machine (TIM) range have been developed by Groundsman Industries specifically to insert Dripper-line Irrigation Pipe down to 15cm deep in a one pass operation to provide water directly to the root zone of any grass surface. The model TIM13 has a 13HP engine and has super-ceeded the 9HP on the model TIM49. If you would like to find out any more information about any of the above Sod Cutters / Sodcutters then please do not hesitate to contact us.